Who’s in charge of education in California? Posted on July 20, 2009 by rpnorton | Comments Off on Who’s in charge of education in California? 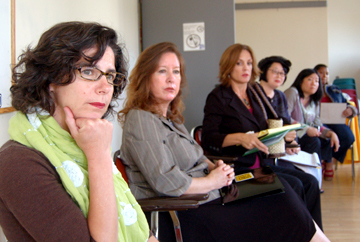 State Senator Gloria Romero (second from left, at a recent meeting with members of Parents for Public Schools in San Francisco), chair of the Senate Education Committee and its Subcommittee on Educational Governance and Accountability, has announced she will be holding a hearing to consider changes to the roles and duties of the state’s key policymakers – the State Board of Education, the Secretary of Education, and the Superintendent of Public Instruction. The hearing will feature Ted Mitchell, President of the State Board of Education, who chaired the Governor’s Committee on Education Excellence; and Dede Alpert, a former legislator and chair of the joint committee that produced the 2002 California Master Plan for Education. The hearing is scheduled for Wednesday, July 29 in San Diego, but the Senator told me and other parents at a meeting sponsored by Parents for Public Schools of San Francisco recently that she would consider holding an additional hearing in Northern California depending on local interest. At that meeting, Senator Romero characterized education reform in California as an “archeological dig,” with legislators having to evaluate layers upon layers of policies imposed over the years. Senator Romero is a candidate for Superintendent of Public Instruction, a statewide office currently held by Jack O’Connell, in November 2010. This entry was posted in politics, Uncategorized and tagged California, governing. Bookmark the permalink.